The popular website Lifehacker.com has a really cool ongoing contest called the MacGyver Challenge. 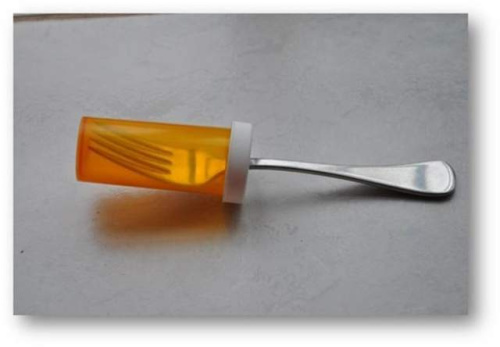 Readers are given a task each week to “hack” an everyday household item into something inventive and clever. From binder clips to wine corks and more, here are some of the best and most useful dieas to date from the MacGyver Challenge! 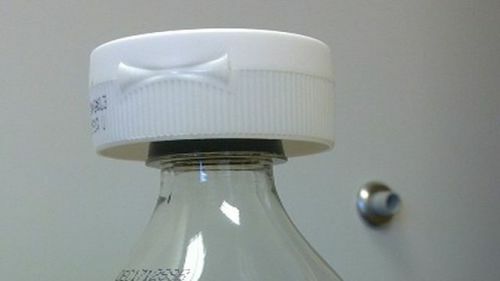 People with arthritis or weak grips will love Lifehacker scorp1us for showing the easy way to open too-tight plastic soda bottles. The lid from a Heinz ketchup bottle fits over the soda bottle top perfectly, giving the user a bigger lid to grab and more gripping power to open the bottle! Lifehacker Sam Terpstra has a simple method for using just two binder clips—one large and one medium—hang nearly anything. 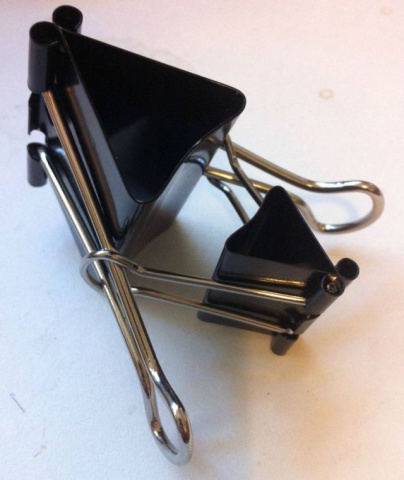 Simply remove one of the metal handles from each of the clips. Hold the clips so the gripping ends point away from each other. Twist the smaller one to slip the handle around the handle of the bigger one. Slide the removed handle back into the empty side, creating the same configuration. The expanded instructions from Sam are available at the link. Reader ELMORROW fixed his wife’s Crock Pot when the handle broke off the lid. 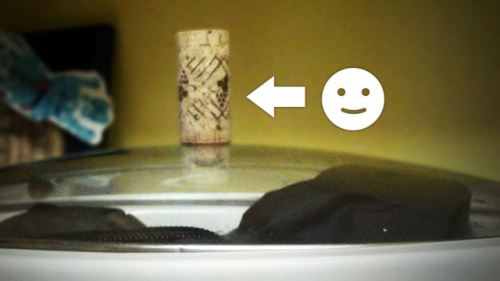 He used the existing screw and washer from the old handle to replace the broken handle with a wine cork! Sure, you can spend good money at a store buying a total cable solution for all your computer and networking wires. 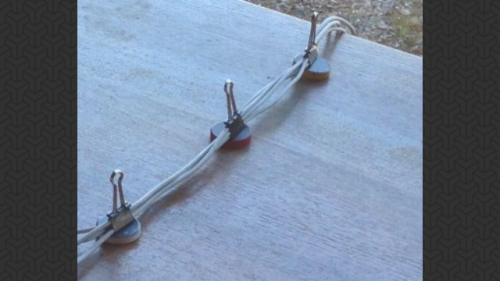 Kevin Kelly’s Cool Tools blog shows us how to use binder clips and magnets to run four cables along a desk. You can also use the binder clip handles to manage notes! I don't think they look quite as great at the surprisingly inexpensive Beluga Cable Management System I just recently discovered, but they seem to work just as well and it is fun to make your own solution with stuff you have laying around in the house. 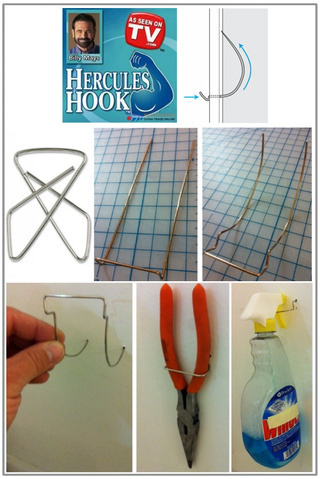 Reader lifehacker3000 created his own DIY Hercules Hook using a butterfly paper clip. (If you are not familiar with how awesome Hercules Hooks are, you can read reviews about them here.) He also decided to improve the Hercules Hook by crimping the clip into a hook with two inserts instead of just one. The thick gauge wire of the butterfly clip is sturdy enough to hang tools and even bottles of cleaner. You can use the hanger on sheet rock, cork or a pegboard. Lifehack reader Thaibinh! uses a Kindle with no built-in reading light. The ones made for Kindle are pricey. 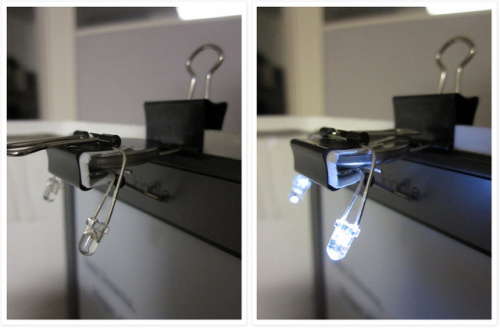 Instead, she uses a small and a medium binder clip, two LED lights, a one-cell battery and a bit of paper to create a clip-on reading light. She describes the design in full on her blog. 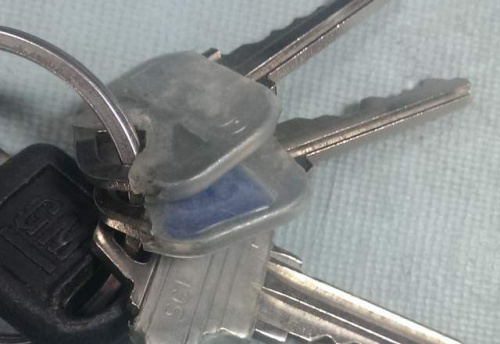 Lifehacker contest winner Profound cut the noise of jangling keys by using heat shrink tubing on the heads of the keys. The plastic tubing comes in different colors-handy for color coding keys. This trick could also be used on dog tags and the like! Just buy a pack of heat shrink tubes and then get inspired. What is your favorite household hack of the ones featured here? Would you try any of them for yourself? 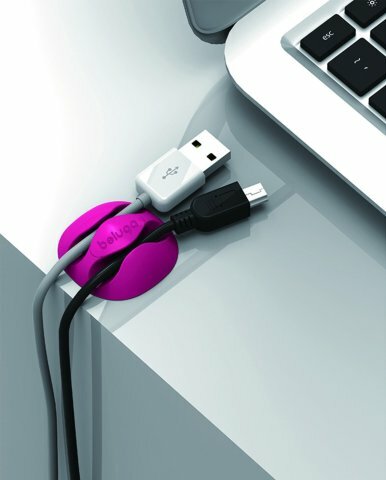 You can see these creative solutions and many more on the MacGyver Challenges presented by LifeHacker.com. Hair and Feathers: Do They Share The Same Roots?